As a new graduate nurse, you have many important choices to make that will launch your career, and there are several hospitals offering new graduate programs. How will you choose the one that’s right for you? The Windham Hospital Nurse Residency Program is the only one of its kind in eastern Connecticut that offers you the most complete nurse residency program available. This innovative and progressive program attracts new graduate nurses who are committed to establishing a sophisticated and unshakable foundation in the way they deliver care while providing exceptional patient experience. It is designed to provide comprehensive learning that builds on your academic knowledge to prepare you with the skills to thrive in our ever-changing healthcare landscape and the advancement of cutting-edge technologies. Problem-based learning and simulation laboratory education comprises about 25 percent of the program. Your curriculum is a shared responsibility. The clinical learning parameters are first set by your RN Clinical Coaches and the direction and depth of your acquired knowledge rests on your engagement, clinical inquiry, and your resourcefulness while working in teams. Reflective supervision and support is offered by experienced and trained facilitators to allow you a confidential and supportive place to express concerns and develop practical tools to deal with the stress of being a new RN. Being a Windham Nurse Resident is a paid job, and following successful completion of the clinical immersion phase, Nurse Residents will be eligible to apply for a position within the organization. Nurse Residents must be able to work any shift (days, evenings, or nights), and the ability to maintain a flexible schedule is required. 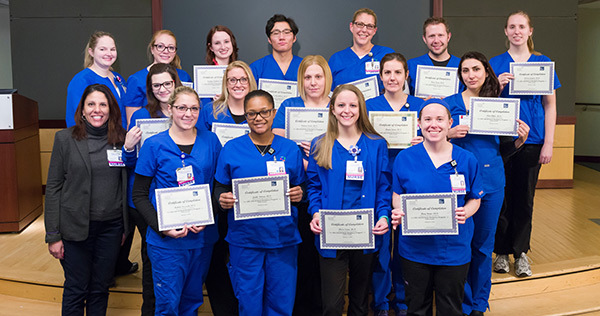 Professional development opportunities are provided to Nurse Residents for the remainder of the one-year period through seminars, simulation laboratory experiences, and monthly check-in meetings with RN Clinical Coaches and Clinical Nurse Educators. Admission to the Windham Nurse Residency Program is highly competitive, and applications are accepted three times a year, with programs starting in February, July, and October. Application must be received in the online application portal. What draws you to the Backus and Windham Community? What qualities do you possess to contribute to your success in a nurse residency program? Do you have a specialty area you are primarily interested in? We must receive all information for you to be considered. For further information, contact EastRegionClinicalExcellence@hhchealth.org.